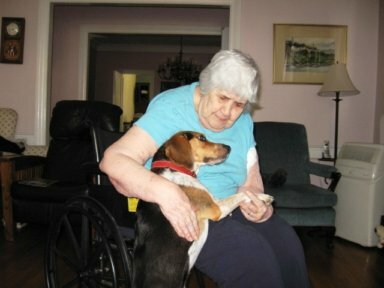 We all know how wonderful the beagle breed is and how much they love people of all ages, so lets dedicate this page to our elders. 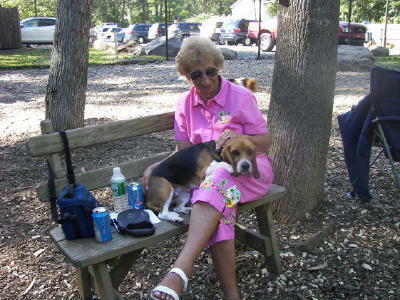 Lets show just how much happiness these silly, yet extremely loving and caring beagles can be and how much pure and simple joy they bring our senior loved ones. Penny loves my Mom. Every morning, when Penny comes downstairs, she races into Mom's bedroom, jumps on the bed and gives her kisses. If it's early, she will curl up on the bed and go to sleep. And Penny goes running to her Grandma when she's scared. Last July, we had a tornado hit. The thunder, wind, rain, lightning were horrible, and Penny was terrified. Nothing I could do would calm her down, and she ran down to Mom. Mom said 'oh, I petted her, told her it was all right and I think she helped me more than I helped her". 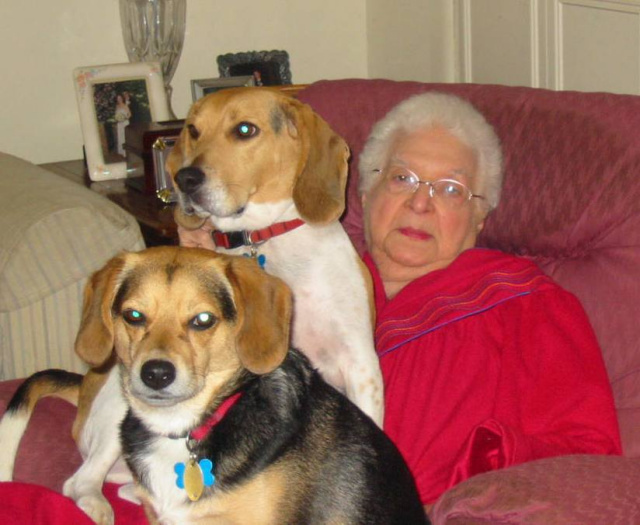 Henry and Bailey provided comfort and companionsip to my mom in her last years. It was a comfort to me to know they were there with her when I wasn't able to be. She loved them and they her. When she began having memory issues she started sleeping downstairs on the sofa. When this happened Bailey stopped sleeping with Henry and me and stayed downstairs with her. He was my extra special boy. 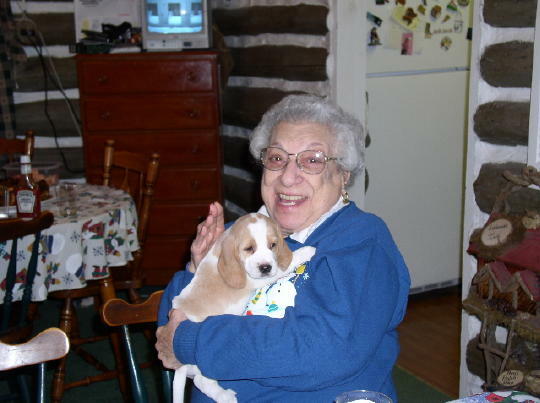 Reese came into our lives not long after losing a beloved beagle, Freckles, at the age of 14. Something so sad for us turned into happiness. 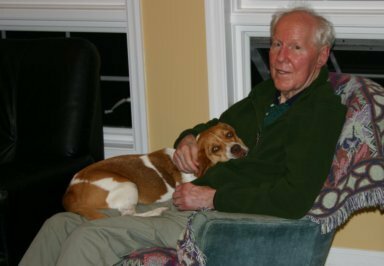 This event came at a time when life had become very difficult with the illness of my mom. 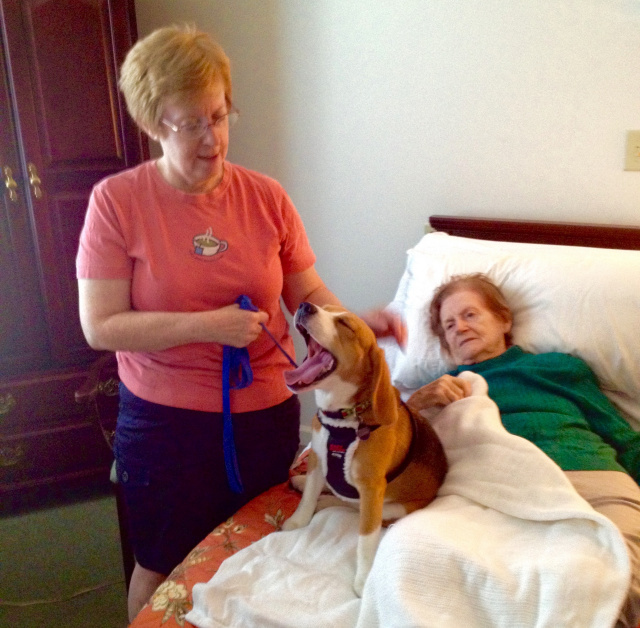 We even sneaked Reese in to visit with my mom at the nursing facility where she was living. She enjoyed his visit so much and he sat patiently on her bed while she stroked him.